We at American Iron Magazine are planning on redoing this “bitsa bike” old Harley 2 cam as a magazine project bike in the next year. These photos of the classic Harley are in “as purchased” condition. Not the incorrect front fender, British dual-leading shoe front brake, incorrect headlight and handlebars, home made exhaust, funky saddlebags and more. 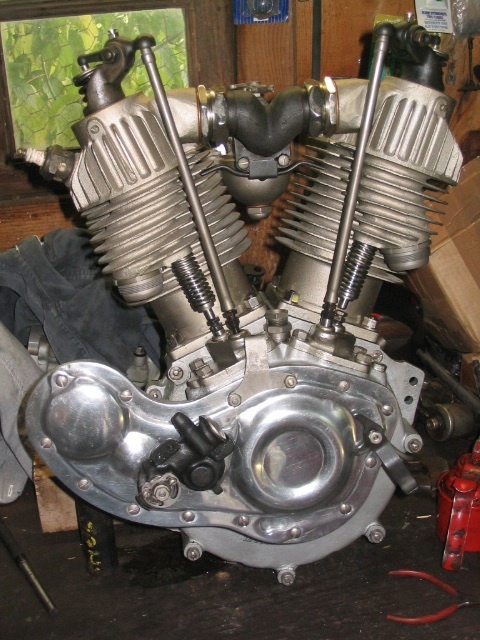 The air cleaner is correct, as is the shifter assembly, forks, rear and side stands, and frame. The genuines old Harley dash has been modified with toggle switches in place of the keys. Center toggle is the ignition switche, the two outside toggles are for lights. The handlbars seem to be modified boardtracker bars. We like the idea of extra lights in the back of the bike as these classic old Harleys came with a very small tail/brake light. HOWEVER, these old Harley turn signals just look wrong on this vintage Harley. They must come off, but we are considering adding small bullet lights under the seat using the same wiring already on the bike for these lights. We expect this project to be in the pages of American Iron Magazine sometime late in 2016. In the mean time we are open to suggestions on what and how to re-do this vintage Harley. I have long been fascinated with early Harley twins, especially the J series models from the 1920s. The most exciting of these street bikes was the limited production JDH “Two Cam” hot rod Harleys produced and sold in 1928 and 1929 only. The Motorcycle Cannonball 4,000 mile cross country endurance ride is less than three weeks away so many of the riders and builders are feeling the crunch. I thought I had my 1929 Harley JDH pretty well dialed in and ready for this amazing ride until I re-read the rules. 1929 Harley JDH Prepped For 2012 Motorcycle Cannonball endurance ride. As far as I can tell I have everything done on this bike to make it legal for this event EXCEPT a functional brake light. I have the original tail light on and working, but it is more a running light than anything else and the rules require a functional brake light. And it is a good safety upgrade too.